If you are as much of a long-in-the-tooth icon of popular culture as Sherlock Holmes, it stands to reason that you will have rubbed shoulders with a few other successful characters over the years. Many films and books have paired Holmes up with individuals who also hail from the Victorian era like Dracula or Jack the Ripper – however, some times the Great Detective crosses paths with characters you would never expect him to. Here are 5 fictional characters you never knew Sherlock Holmes had met. 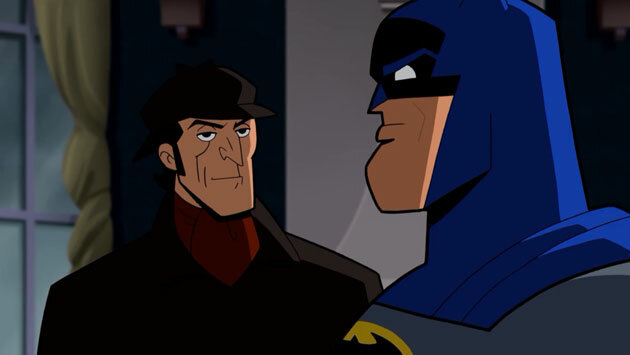 It is worth noting that Batman is a character who is actually partly inspired by Holmes (he is also called the World’s Greatest Detective, after all) but, still, it is pretty odd that these two very different crime fighters have come face to face. But so they did in an episode of animated series Batman: The Brave and the Bold. In it, Batman arrives in Victorian times to track a time-travelling demon, whereupon he teams up with Holmes to catch the culprit. The two surprisingly hit it off, in a one-upmanship kind of way. Plus, Batman manages to beat Sherlock in the deductions game (see above). We’ve no idea what led the makers of DVD movie Tom and Jerry Meet Sherlock Holmes to come up with this crossover. Maybe you could say the cartoon duo’s cat and mouse game is akin to how Holmes chases criminals? For whatever reason, this movie happened. It sports the high-concept premise of having Sherlock Holmes and Dr Watson solve crimes with Tom and Jerry as their anthropomorphic assistants. The cast is surprisingly awesome, with Malcolm McDowell from A Clockwork Orange as Moriarty, Lord of The Rings’ John Rhys-Davies as Watson and Austin Powers’ Michael York as Holmes. When there’s something strange in the neighbourhood, who you gonna call? Well, Sherlock Holmes, apparently. In an episode of 80s cartoon The Real Ghostbusters, the titular gang are aided in stopping an evil spectre of Professor Moriarty by ghostly versions of Sherlock Holmes and Watson. Apparently, Holmes and Watson are fictional characters in the Ghostbusters world but their fame has called them into existence in a quasi-ghostlike state. No, me neither. For all its wackiness, this episode ends on a clever redo of the Reichenbach Falls, as ghost Holmes and Moriarty tussle over the edge into the Ghostbusters’ Containment Unit. 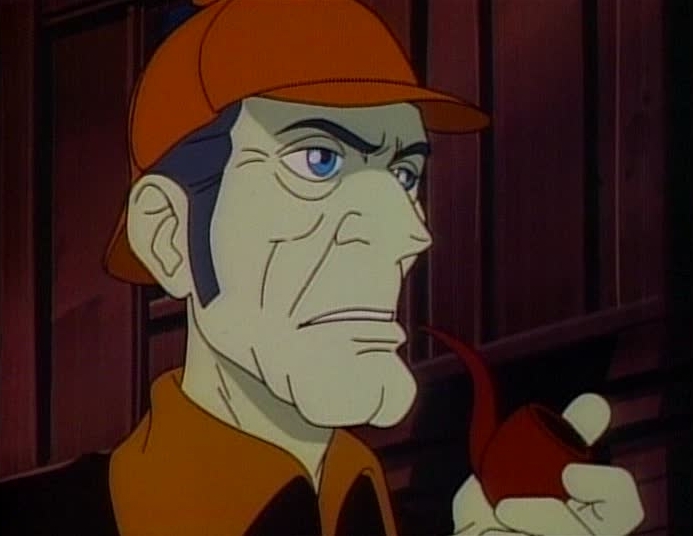 Who could top Ghostbusters and Batman as the weirdest cartoon crossover involving Sherlock Holmes? That honour has to go to the time the Great Detective met the Teenage Mutant Ninja Turtles! This episode of the 80s TMNT cartoon sees the heroes in a half-shell accidentally go back in time to the 1800s. Their arrival causes Moriarty to get his hands on the secret of time travel and go on to run a Terminator-like dystopian future. Thankfully, Holmes and the Turtles team up to defeat him and put history back on track. The crossover that is talked about the most is for Benedict Cumberbatch’s Sherlock to meet Doctor Who‘s the Doctor – so that the BBC’s two greatest heroes can team up. While this hasn’t happened yet, other incanrations of Sherlock Holmes and the Doctor have come face to face. A radio drama called All-Consuming Fire was released last year which saw Sylvester McCoy’s Time Lord join forces with Holmes (as played by Nicholas Briggs, who voices the Daleks on the TV show) to foil a mystery which revolves around an ancient, alien evil. Listen to the trailer for it above. What other odd encounters with fictional characters has Sherlock Holmes had? Let us know in the comments! The audio All Consuming Fire was originally a novel from the 1990s. Holmes and Watson meet the Doctor, Bernice and Ace. They later meet up in Happy Endings for Bernice ‘ s wedding. Thank you for including this proof that Sherlock had met Doctor.